Yobe North Senator, Ahmed Lawan, has flagged off his campaign to become the next Senate President. Mr Lawan, currently the Senate Leader, kicked off the campaign in Lagos on Sunday urging his colleagues to endorse and vote for him. Details of the kick off was published by The Nation. Mr Lawan has had his eyes on the number three position since 2015. In 2015, the APC endorsed him following zoning of the position of the president of the Senate to the North-east. However, he failed as the incumbent, Bukola Saraki, emerged president of the Senate against his party's wish. Mr Saraki's reign was characterised by faceoffs between the executive and legislature even before he dumped the APC in 2018. On Sunday, Mr Lawan said the next Senate would assist the country by helping President Muhammadu Buhari to achieve his agenda. He said the doctrine of the separation of powers should not translate into an unnecessary rift that will cripple harmonious working relations among the organs of government to the detriment of the country. His campaign manager, Yahaya Abdullahi (senator, Kebbi North), said Mr Lawan's entry into the race is a new beginning for the Senate. He also hailed Oluremi Tinubu for "the partnership for the progressive agenda". Mrs Tinubu, the wife of senior APC leader, Bola Tinubu, had few weeks ago made public her intent to become the next Deputy Senate President. Mr Lawan, who described himself as a progressive, observed that the next Senate will be made up of seasoned professionals, technocrats and statesmen, adding that "the experience we have garnered will help us to assist the country through legislation". 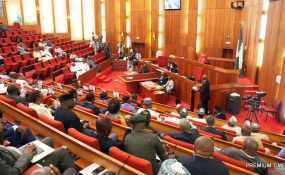 "I have been in the National Assembly for almost 20 years. I have served in the House of Representatives for eight years and the Senate for 12 years, I thank God and my people for renewing my mandate. "I am a progressive. I was an APP and later, ANPP House of Representatives member and I am now in the APC. I believe in the progressive politics, in ensuring that ordinary people - the masses - get support and opportunities to actualise their potentials and dreams. We should support entrepreneurship and business to grow and thrive for employment to boom." "We need a National Assembly that will look at Nigeria as its constituency. We want a Senate and a National Assembly that will maintain cordiality, synergy and cooperation with other arms of government." Mr Lawan said the welfare of Nigerians should not be compromised, adding that jobs and wealth "should not be concentrated in a few hands." "We may disagree. Our perspective(s) may differ. We don't go to the market square to settle our differences. We should be able to meet and discuss issues and make compromise in the national interest. That is the way to grow democracy. We may disagree, but the disagreement should not escalate," he said.